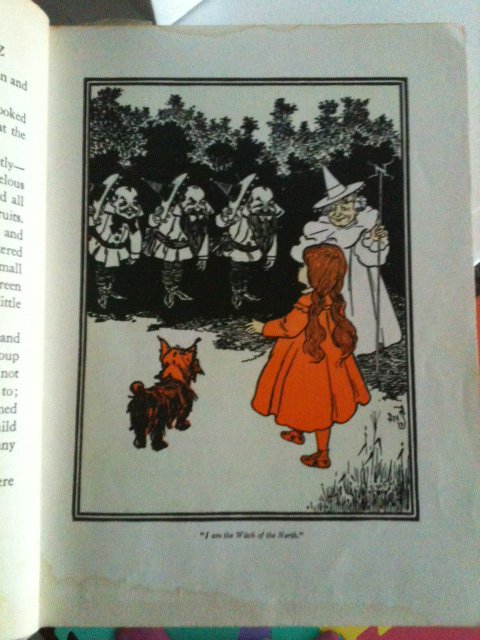 I started reading The Wizard of Oz to the babies last night. The original one. 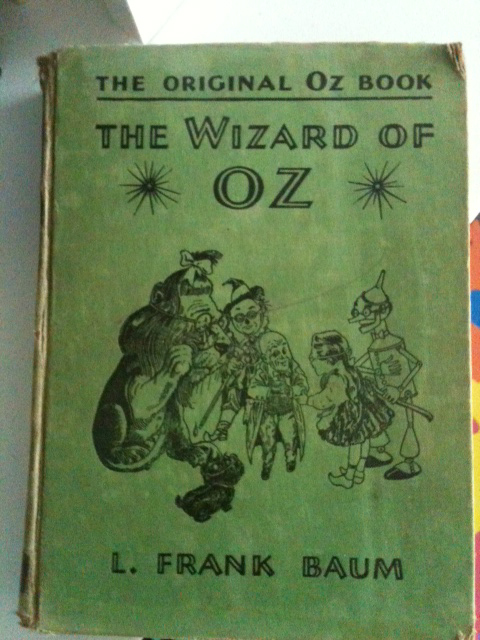 Here’s the Wikipedia page on it: http://en.wikipedia.org/wiki/The_Wonderful_Wizard_of_Oz. The book we have is one of a series, all of which my mom has. They’re all hard cover; all illustrated. All lovely. The inside page says copyright 1899, copyright 1900, copyright 1903. 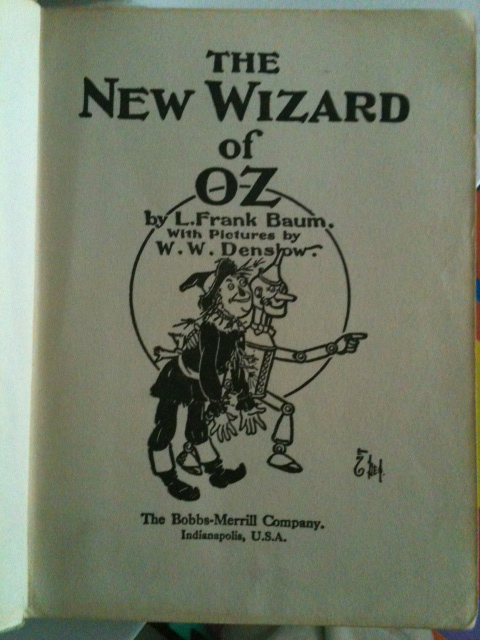 It also says “The New Wizard of Oz” – so I am going to guess it’s a second (third, fourth) run of the original. When I was little, I read a lot of books with illustration plates – that is, the back of the illustrated page wasn’t printed on. The illustrations in the book are tremendous – they are clearly engravings, some are in color, most are not. Several are in two color. The start of each chapter features a quarter page graphic and an initial word (I don’t know how else to phrase that). The pages are very thick, like construction paper. It’s the type of paper that if you pressed with your thumbnail, you’d poke a little crescent moon through the paper (sad confession: I did this to many of my books when I was little). Here’s a shot of a spread, complete with the terrific Claremont Books bookmark I found tucked into the pages. 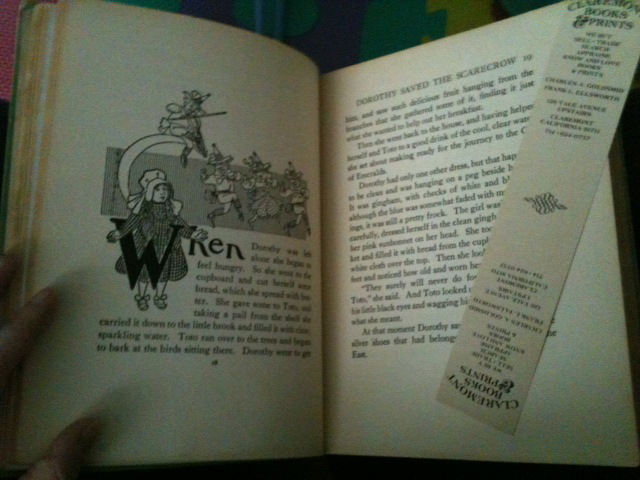 A chapter page for the Wizard of Oz, and the bookmark I found in the pages. Some differences I’ve noticed from the later movie: There are four witches, the wickeds are East/West, the goods are North/South. The good witch of the North is very old (whereas, Glinda is portrayed as young and pretty). The ruby slippers (at least at this early stage) are silver. Dorothy is about 6. We just met the Scarecrow, so we have quite a way to go, yet. 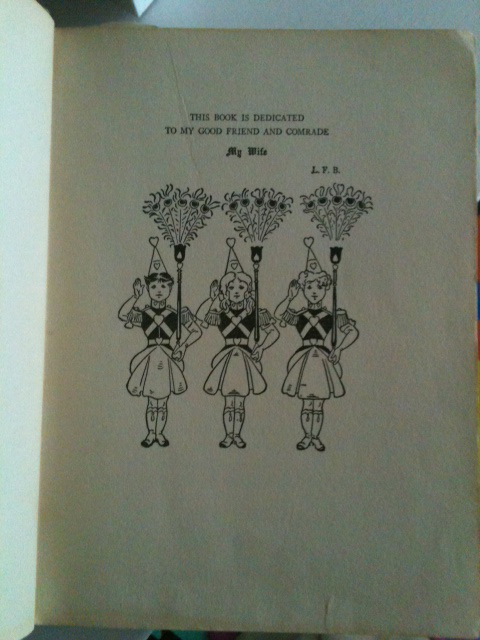 The title page - "The New Wizard of Oz"
"I'm am the Witch of the North"